Our extensive range of sliced Italian salami produced from many regions of Italy including the Finocchiona or Fennel salami,one of Tuscanys most famous salami,cured with fennel seeds to give a wonderful flavour. All sliced salami are freshly cut to order and delivered wrapped in traditional waxed deli wrap paper giving 7 days shelf life. Rustic Mixed Antipasto Contadino , containing Olives,Mushrooms,Artichokes,Silver Skin Onions and Red Peppers all in Olive Oil that makes a great appetizer ..
Made from coarsely chopped pork and seasoned with Paprika,this Choriso is Piccante,so is on the hot side. As this is the cured Choriso it can be eaten directly,..
Made from the neck and shoulder of specially selected pigs,Coppa di Parma is a whole joint of meat that comes exclusively from the Emilia-Romagna region of nort..
A very typical Tuscan salami,Finocchiona has its origins in the middle ages when the soaring price of pepper forced charcutiers to flavour their products with w..
Let us take the job of deciding what to have on your lunch board with our Italian Tapas Selection. 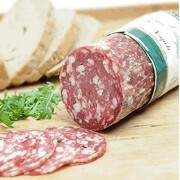 Consisting of 100 grams each of freshly sliced Italia.. The famous Milanese salami,made with finely minced pork,garlic and red wine,Milano is cured for four months and when cut exhibits its rice grain texture. A rich..
Mortadella is Italys second most consumed cured pork product after Parma ham. Known in America as "Baloney" and produced in sizes ranging from one kil..
Mortadella is Italys second most consumed cured pork product after Parma ham. Known in America as "Baloney" and produced in sizes ranging from one kilo up ..
Our Napoli salami has a very gentle smoked flavour,with added black pepper corns and an intense aroma of beech and oak reminiscent of the areas where it is prod..
New to our range of charcuterie,this Truffle salami is flavoured with the unmistakable flavour of Truffle , giving it a wonderful rich taste and aroma. Enjoy..
Serrano Ham is the best known Spanish ham and we are pleased to introduce these hams from our supplier in Spain,La Alegria Riojana,who also make the wonder..
Due to a number of requests we can now offer our Smoked Pancetta in smaller 250g pieces Perfect for chopping into cubes and adding to pasta sauces such as ..
Smoked Pancetta is smoked and cured raw pork belly that is usually added to pasta sauces to give a beautiful smoked salty flavour. It also works very well wh.. The word Sopressa literally means two things in one,Salted and Pressed,and this authentic version is flavoured with mild garlic and goes very well with another ..